I have used many models of MT and this one is by far the most practical and toughest model of all. A bit pricey but if you get one (and don't loose it xD) and take care of it it will last. I have buddies who have the exact same for almost a decade and still going. great multi-tool i carry it everywhere! would defiantly recommend. I wore my multi-tool for 6 years when I was in the Army and another 4 as a civilian. It traveled the world with me including a 15 month tour in Iraq. It mended fences, hunted, took catfish off trot-lines, and a whole bunch of other tasks as a civilian. Recently my wife and I discovered a box filled with my Grandfathers bayonet, watch, and other military memorabilia from his service in WW2 and Korean wars. We made a little shelf space for his stuff and put my stuff right next to it. My 600 is now retired and proudly on the shelf next to my other items from my Iraq tour. My 600 is one of those things that will be passed down to my kids and grandkids. Yes I replaced it with another Gerber and wear that everyday on my family farm. My original is now an heirloom. I was issued this multi-tool when i was 19, i carried it all through my military term including a 12 month deployment to Afghanistan. Im 26 now and still use it everyday, for fixing fences and my children's bikes, very tough tool definitely recommend this. I have one of the tools with what appear to be carbide inserts in the pliers to cut and strip wire. Whatever they are made of they are excellent for this purpose. The lifetime warranty means just what it says. I returned mine to the factory after it was run over by a boat trailer. Not your typical materials or workmanship issue. They promptly replaced it with a new tool, even including a new sheath which I admitted I had lost. The decline in customer service and satisfaction that seems to be afflicting many of our institutions has not infected Gerber. I highly recommend this company and it's products. 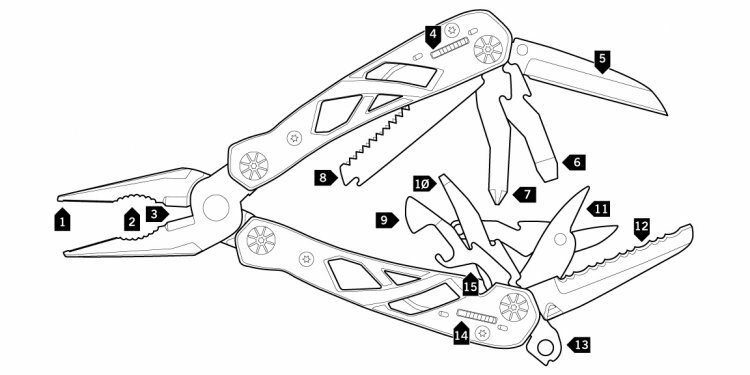 I've owned a Gerber multi-tool for 20 years and use it many times every day. It takes some pretty good abuse and holds up for years. I use it as a welding pliers and it is sturdy enough to cut through metal banding on pipe bundles. Nothing compares to this tool. It's in a class of its own. The only bad thing I can say about this tool is that the lanyard ring seems like a wasted tool slot. It is a very comfortable tool to hold and to use, and the pliers are strong enough to cut through mettle strapping, wires and chaining fence with no problems. Compared to multi tools like the Flik, the screw drivers are not only easier to use but actually useful by comparison, i.e. the Philips for example actually grips into the screw, and the small flathead can bemused to on most glasses sized screws I have needed it for. I also like the sturdiness of the new knife blade compared to the older models. It's solid build makes the old bad look quite flimsy by comparison. Nothing better!! I just received my new 600. After wearing out my old one, it only took 15 years and 6 deployments and countless small exercises to wear it out. I cant even start to describe what all this tool will excel at doing, lets just say it's the only tool that goes with me EVERYWHERE I go. Can't go to work with out it. I owned a previous version of this one for 14 years. I got my first one while in the Marines back in 2000. While at work it was stolen off my tool bag. The knives are razor sharp and and the phillips head screwdriver is better then craftsmen. It's my first goto tool. I was the only one at my company with a Gerber when i started, now 5 years later 3/4 of my maintenance crew own a Gerber. This is much ligher, but just as strong as a leatherman. I have given up on leathermans since I've used these extensively. I have use this tool at work and love it, have the people I work with use it they like it too and mite get one. Just need wire cutters replacement for this one. best birthday gift ever! i used it to rewire my garage and the tail lights of my wife's car. My 600 has been to Afghanistan a few times and is now in my pocket as my EDC tool of choice. Today, though, was a sad day as I accidentally broke the file off trying to fix the dryer. It was my fault. It's built like a beast. I love it and will never part with it. Broken or not, everything else on her still works and never disappoints. Get one! Very resilient and corrosion resistant - Clean it, lube it up and put it back to work. Found one of these out in grass field while working near Fort Luis, Military Base. The tool had obviously been out in the wet environment for quit some time; most its folding tools were either too hard to open or now failed to lock into place. All it needed was some WD40 and a towel to wipe it down and break loose all the dirt and gripe gumming up everything. Next I worked in some Bramec, general purpose Zoom Spout oil and this Gerber Multi tool is back to good as new again! FYI: I made every attempt to find the original owner, but I had zero information to go off of. Sent in my old 600 multi pliers to repair/replace broken knife blade. Gerber sent me a new model 600 . I'm with Gerber for life, love their knives and tools. Have had it for at least 10 years and use it from work to recreation. Don't leave home without keys, money, cellphone, and my multi-tool! Blade broke after a decade of use so i sent it in to get repaired and they sent me a new one with sheath! Whatever yall do don't start making them cheap and stay out of china!